As I stayed in Qingdao during the Looking China program, people kept asking me what was my impression of China before I travelled there, and how had it changed after I did that. I must confess I often felt embarrassed with this question. What does one know about a place without having studied it properly, or having ever been there? China had never been (and admittedly still isn’t) an object of serious study for me. And even now that I have been there, it is very hard to find the right words to express what I feel. By doing that, I feel that I may be somehow inconvenient, and that I will bite more than I can chew. That being said, I can’t think of any other way to write this summary. That’s why, nonetheless, I will try. By and large, China for Europeans has always inspired a mixture of charm and suspicion. I suppose the first was due to the perception of a vastly different lifestyle, traditions and values. Why not? Even for its obvious beauty. The second, because of the difficulty in understanding their meaning. The very difference that inspires our awe also makes us wonder about its true face. Of course, what I wrote applies both ways: I can imagine Chinese people may feel similar mixed feelings towards European culture. Which begs the question: how do we bridge the divide? And how can we trust that we actually succeeded? The first thing one must do, I believe, is to question this same very question: provided there is one, what divide are we talking about? What is it that divides us and that must be bridged? Along the course of roughly three weeks, international students from Portugal, Brazil, Italy and Belgium had plenty of occasions to discuss the big and tiny differences between their habits and the Chinese ones. Be it the dining hours, the health care, the socializing process, the educational system, it was relatively easy to spot differences. Although there’s nothing wrong with it, it must be noted that there’s nothing much special about doing this. This sort of gap is among the easiest to cover. All it takes is for one to make a list and change one’s routine according to it. It doesn’t actually require to question ourselves as people, or the way we envision others. So what constitutes the divide I’m talking about? In order to get there, I suggest taking the longer path, the one that, usually, gets the traveler to the place he desires in the shortest time. That’s why I want to focus on the opposite task, the one that, at the very least in my eyes, has received much lower dedication: which is, find out about the things we do share. And I’m not talking about a vague notion of common values, something that is often called for but seldom justified. For what is value? Is it even an inherently positive concept? Shouldn’t we rather face the uncomfortable truth that value is, taken by itself, a neutral carrier? It may seem like I’m digressing, but I believe I’m not, for the commonality I’m describing is not an inherently good one, either. But it exists nonetheless, and this project gave the chance to the ones who participated to touch it with their own hands and, most importantly, heads. So what do we share? In the opening speech I prepared for the ceremony in Beijing, I briefly referred to an interaction I witnessed between a Chinese boy and an Italian girl who had no idea how to communicate with one another. Imitation and playing made up for the language divide and, even for a short while, brought them together. Of course, we may readily discard this as puerile: does this teach us anything relevant when deadlines start falling on our backs? Or what about when the translation doesn’t work and, as a result, misunderstandings of different size ensue? Are we supposed to solve it through playing and gesturing? By writing what follows, I don’t mean to underestimate the enormous burocratic work that these kind of questions imply and ask of the organizers. Even so, I must run the risk of facing ridicule, and claim: sure. Why not? An obvious example (because of the element of play) may come from one of the head directors of this program, professor Gonçalo Galvão Teles. Hasn’t he played soccer with a team of Chinese youngsters he had never seen before and, by doing this, created a momentary league of people that was united in the pursue of the same goal? Hasn’t that suggested to one of the bystanders to invite him in the weekend and teach those same boys something more about sport? Of course, once again, this may be dismissed as secondary, as something fleeting. To which it must be replied: so what if it’s fleeting? Isn’t history made by moments that achieve their meaning with the passing of time? This extends even beyond playing, and embraces the very job we had come to do in the first place: making movies, in an attempt to face and discover Chinese culture. In other words, to make art. Yet another doubt may arise here: isn’t art the most subjective and differentiated realm of all? Isn’t it crossed by differences in geography, style, technique, so persistent to make it an unlikely ally in our quest for commonality? I suggest we do not lose courage and look further than that. 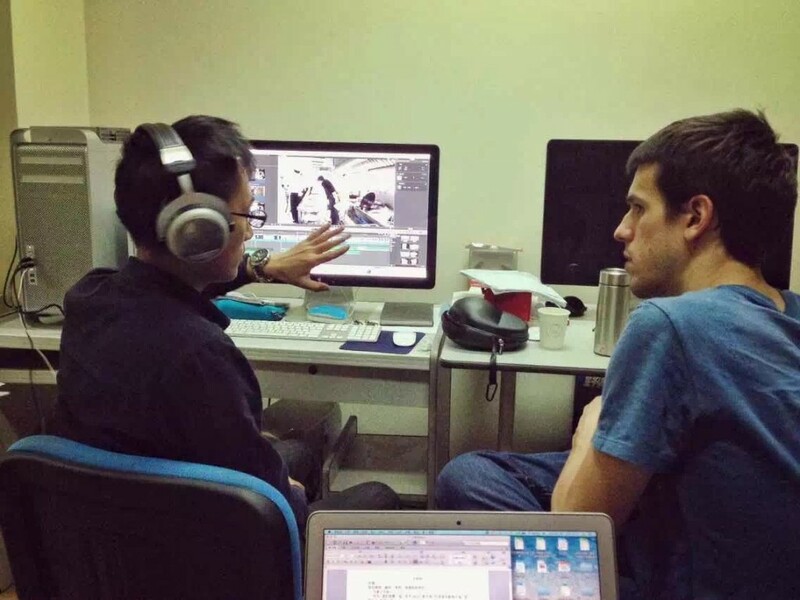 During the difficult five days of editing, I had the privilege of being partially assisted by professor Qiu Bingchang, from Qingdao University. He spoke very little English, not enough to let a conversation happen. The same applied to me with Chinese. Of course we would have my local assistants as translators, at times, but he had a way to make himself being understood even without their help. His way was the language of cinema. As the film was built from scratch, he would sometimes look at the screen and stare at it thoughtfully. I would not be able to explain to him what I was doing in words, but I didn’t need to. The logic of the images and the structure of the narration spoke for itself. Then, he would either nod or seem doubtful, or just point at the shots being displayed. Other times, he would take the seat and make suggestions by interacting with the footage. It was enough. The divide was bridged. Through the means of the picture and its editing, he understood what I wanted to tell and I understood his feedback. In that moment, we weren’t an Italian student and a Chinese professor. We were just two people working on a film together. I must say that, both in the present and the past, for better or for worse, I rarely felt such mutual creative understanding, without the need to explain myself for a very long time (once again, I don’t want to seem so naïve as to neglect that, eventually, lengthy explanations will be necessary). All this doesn’t mean that we’re talking about super-humans who are able to transcend the barriers of culture. I simply think that it is the commonality arising through people who are willing to let it happen, and that this is virtually in the grasp of everyone. This, I think, must be the starting point for considering what Looking China has been to us. Otherwise, it’s just about yet another cultural cross-check, or yet another way to make ourselves more distant and obscure. During my stay, I’ve been told of a God that is considered to be the Mother of everything that is created. When I asked if this God is then considered to be a female, the answer was, “No gender.” I can’t help but think that the same thing applies to Christianism, as well. Isn’t the Christian God a Holy Father that has no actual gender? And what if God has no gender so that it can unite those who have it? What if art, play and sports are made, first and foremost, so that it can bring closer those who practice them? What if the differences that separate us are merely the necessary ingredient to let us be together? These questions I owe to my experience in China. The least I can do is to devote myself to answer them.